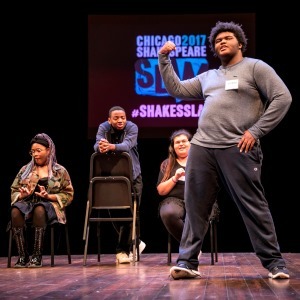 Chicago Shakespeare Theater brings together 300 high school students and their teacher coaches from 40 public, private, and parochial schools across the region for this year’s Chicago Shakespeare Slam. A series of Saturday workshops and regional preliminary bouts throughout the fall culminate in a spirited, fun-filled Final Bout on Monday, December 10 at 6:00 p.m. on the stage of The Yard at Chicago Shakespeare. Emcees warm up the crowd and an onstage DJ drops beats as nine teams perform, cheered on by a full house of fellow participants, classmates, and friends. This year’s Final Bout performances will also be witnessed by an accomplished panel of judges, including Chicago Fire’s Eamonn Walker, Hamilton Chicago cast members Ebrin Stanley and Jimmie "JJ" Jeter, Melisa Soledad Pereyra from Chicago Shakespeare’s A Midsummer Night’s Dream, and multiple Jeff Award-winning actor Heidi Kettenring. Slam teams advancing to the Final Bout on December 10 include: Chicago High School for the Arts (Chicago), Fenton Community High School (Bensenville), Francis W. Parker School (Chicago), Homewood Flossmoor High School (Flossmoor), Kennedy High School (Chicago), Lindblom Math and Science Academy (Chicago), Mundelein High School (Mundelein), Niles North High School (Skokie), and Warren Township High School (Gurnee). In the first round, a scene chosen from any play in Shakespeare’s canon. In the second, a creative exploration inspired by one play that the entire Slam community is focusing on that year—the same play that Chicago Shakespeare is abridging and staging for student audiences. This year, students explore Shakespeare’s classic drama, Macbeth. Chicago Shakespeare Slam is first and foremost an ensemble program—building community within each school’s team and also between the many participating teams. Together, students have the opportunity to dive deep into a shared text through the lenses of their own imaginations and experiences. Chicago Shakespeare Slam is just one component of the Theater’s award-winning education programs, which have impacted two million students to date. Chicago Shakespeare Theater brings Shakespeare’s text to life for thousands of students every year, and offers celebrated professional development programs and curriculum resources for more than 2,500 teachers annually. Chicago Shakespeare’s education programming has been honored with the National Arts and Humanities Youth Program Award, presented by First Lady Michelle Obama in a 2014 White House ceremony, and the Folger Shakespeare Library’s national Shakespeare Steward Award for innovative teaching of Shakespeare in classrooms. More information on the program at www.chicagoshakes.com/slam2018. Under the leadership of Artistic Director Barbara Gaines and Executive Director Criss Henderson, Chicago Shakespeare has redefined what a great American Shakespeare theater can be—a company that defies theatrical category. This Regional Tony Award-winning theater’s year-round season features as many as twenty productions and 650 performances—including plays, musicals, world premieres, family programming, and presentations from around the globe. Chicago Shakespeare is the city’s leading presenter of international work, and has toured its own productions across five continents. The Theater’s nationally acclaimed arts in literacy programs support the work of teachers, and bring Shakespeare to life on stage for tens of thousands of students annually. Each summer, the company tours a free professional production to neighborhood parks across Chicago. In 2017 the Theater unveiled The Yard, which, together with the Jentes Family Courtyard Theater and the Thoma Theater Upstairs, positions Chicago Shakespeare as Chicago’s most versatile performing arts center.